As plants, animals, volcanoes, human beings, cars, and factories emit gases and particles into the atmosphere, invisible molecules in the air around us act as miniscule cleanup crews to remove this pollution. These tiny cleansers are known as oxidants and are crucial for maintaining climate and human health. In atmospheric science, they pack a powerful punch against pollutants: when oxidants chemically react with pollutants and greenhouse gases, they cleanse these pollutants from the atmosphere by altering them into biologically useful or easily dissolved agents, such as carbon dioxide or nitrates. In order to better understand the power of atmospheric oxidants—and the factors that effect their ability to do their work—Lee Murray, an assistant professor of earth and environmental sciences at the University of Rochester, developed a computer model that shows how the concentration of oxidants changes under different climate conditions and temperatures. Then Murray, along with colleagues at the University of Washington, Princeton, and Harvard, compared model data to analysis conducted at the University of Washington’s lab on 100,000-year-old Greenland ice cores. Their surprising discoveries, recently published in the journal Nature, led them to rethink what it is that controls oxidant levels. Atmospheric scientists had believed that levels of ozone—one major oxidant—in surface air rise as temperature increases. Water vapor, plants, and soil bacteria emissions contribute to the production of ozone, and because these increase as temperature warms, existing models of atmospheric chemistry typically find more ozone in warmer climates. What the ice core measurements implied, however, is that when the atmosphere underwent large temperature shifts, ozone levels were actually greater in colder periods than in warmer ones. How did 100,000 ice cores yield this information? And what might explain the unexpected finding? “We’re interested in how the reactive composition of the atmosphere has changed over the past because it helps in determining how human activity might perturb the atmosphere into the future,” Murray says. Murray draws on that atmospheric data to develop computer models that might help make these projections. And the better and more refined the data, the more confident he and other scientists can be in the predictive capacity of their models. Ice cores provide a 100,000-year-old climate record, starting with a warm period, continuing through a full Ice Age and ending at the present day, with several shorter periods of abrupt warming and cooling in between. In order to explain how ozone levels could be higher in colder than in warmer temperatures, the researchers had to figure out what factors were more influential than temperature effects on emissions in determining ozone levels. After comparing model and ice core data, the researchers proposed two new mechanisms that they hypothesize may affect the concentration of ozone. The first involves increased circulation of ozone between the troposphere—the air around and above us where weather occurs—and the stratosphere, directly above it. Ozone is “good up high, bad nearby.” Stratospheric ozone—where the so-called ozone layer is found—is important for shielding harmful solar radiation and preventing cancer. 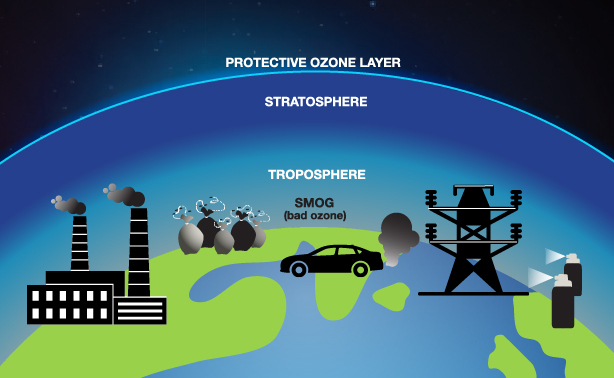 Tropospheric ozone is a major oxidant that helps cleanse pollution from the atmosphere. However, when ozone is produced close to the Earth’s surface (as with smog created from vehicle exhaust and power plants), it acts as a biological irritant that can lead to human health problems, ecosystem damage, and crop losses. Air circulates between the stratosphere and the troposphere, rising in the tropics and dropping back down at the poles, in a pattern known as the Brewer-Dobson circulation. Several factors can speed up this circulation, including sea surface temperatures and natural- and human-induced greenhouse gas levels. 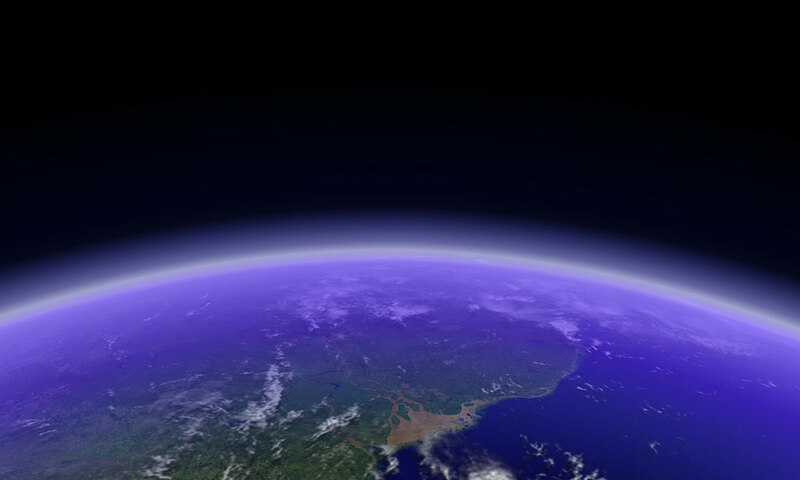 Since most ozone is produced naturally in the higher-level stratosphere, if circulation speeds up, more ozone would be transported from the tropical stratosphere where it is primarily produced to the troposphere. A second possible explanation for the finding, researchers say, is a less-understood group of oxidants: halogens. These chemical compounds that include chlorine, iodine, and fluorine, have not been fully studied, but researchers suspect they could compete with, and therefore influence, the levels of other oxidants, including ozone. “The largest source of halogens is from sea salt, and we know from ice cores that sea salt is much higher in colder climates,” says Becky Alexander, an associate professor of atmospheric sciences at the University of Washington. The researchers suspect that both factors act in tandem to affect oxidant levels during the big swings in Earth’s temperature. Recognizing the mechanisms that affect oxidant levels can help researchers see how human activities might then alter the natural levels of ozone oxidants present in the atmosphere.